Hoffman Estates, IL – April 12, 2019 – The Collision Repair Industry Snapshot Survey, co-sponsored by the Collision Repair Education Foundation and I-CAR©, has launched and is open for responses from collision shop owners and managers. The data collected by this year’s study will be compared to previous research going back to 1995. Collision industry training, employment, pay and benefits trends over the years will be analyzed and results shared with the industry. Survey respondents can enter to be eligible to win one of three Gift Cards valued at $300, $200, and $100 respectively. All responses will be kept confidential and results will be reported in aggregate; respondents will not be contacted; and the list will not be sold or shared. Any specific questions regarding the survey can be directed to the Collision Repair Education Foundation at info@ed-foundation.org. The Collision Repair Education Foundation, founded in 1991, is a not-for-profit organization dedicated to supporting collision repair educational programs, schools, and students to create qualified, entry-level employees and connect them with an array of career opportunities. For information on how to donate to programs supported by the Education Foundation visit us online at: www.CollisionEducationFoundation.org. 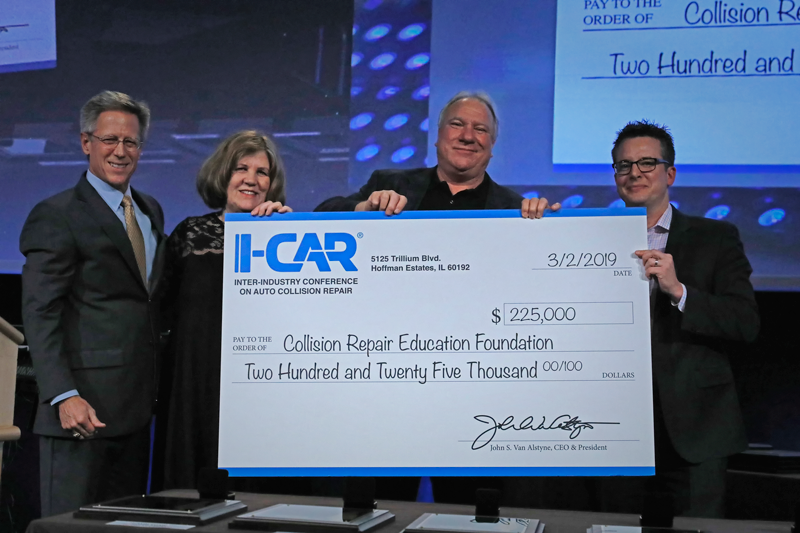 Hoffman Estates, IL – April 9, 2019 – I-CAR© expanded its support of collision schools and students, making a $225,000 donation to the Collision Repair Education Foundation. The contribution was made as part of I-CAR’s 40th Anniversary Volunteer & Instructor Conference held March 1-3 in Orlando, Fla. The financial contribution by I-CAR is in addition to the support to the Education Foundation’s mission by local I-CAR committees across the country. The monetary contribution assists Education Foundation’s ability to offer collision school tool, equipment and instructor training grants and student scholarships across the U.S.
I-CAR’s support of the Collision Repair Education Foundation is longstanding and continues to grow. The Foundation began operating in 1991 as the I-CAR Education Foundation to address the collision industry need for qualified entry-level employees by support career and technical schools and colleges. Today, the Collision Repair Education Foundation provides support to schools with more than 20,000 students studying for a career in the industry. Since 2012, I-CAR has provided financial donations to the Foundation totaling more than $1.3 million dollars; I-CAR’s source of funding for these donations is the accrual of a portion of annual industry training proceeds, which is why I-CAR refers to this donation as being “on behalf of the industry.” The funds assist the Foundation in its mission to support collision repair educational programs, schools, and students to create qualified, entry-level employees and connect them with an array of career opportunities. The Collision Repair Education Foundation Benchmark grant supports collision schools and instructors by providing tool, equipment and instructor training support. In 2018, the Foundation provided more than $500,000 to schools through the Benchmark Grant. This spring, the Foundation will award more than $200,000 in scholarships to students studying for a career in the collision industry. Last year, ten local I-CAR committees raised funds to support student scholarships through the Foundation. Members of local I-CAR committees, collision repair facilities, insurance companies and suppliers interested in supporting school grants should contact Education Foundation Director of Development Brandon Eckenrode at (312) 231-0258 or Brandon.Eckenrode@ed-foundation.org. Suggested Caption: I-CAR continued its support of the collision industry pre-employment education system with a $225,000 donation to the Collision Repair Education Foundation. (L-R) John Van Alstyne, I-CAR CEO & President, presented the donation to Jeanne Silver, from Butterfield Bodyworks CARSTAR and the chair of the Foundation Board of Trustees, Clark Plucinski, executive director of the Foundation and Brandon Eckenrode, director of development, during the I-CAR 40th Anniversary Volunteer & Instructor Conference in Orland, Fla on March 2. Founded in 1979, I-CAR is a not-for-profit education, knowledge and solutions organization designed to support the evolving needs of the Collision Repair Inter-Industry. I-CAR is focused on improving the quality, safety and efficiency of auto collision repair for the ultimate benefit of the consumer. Hoffman Estates, IL – March 21, 2019 – – KSI Auto Parts has contributed over $250,000 in financial and in-kind support for collision repair schools through the Collision Repair Education Foundation. KSI contributed $25,000 to support the Foundation last year and initiated a program to donate parts to collision school programs. Through the parts donation program, they have contributed $240,000 in parts to schools, The monetary contribution assists Education Foundation’s ability to offer collision school tool and equipment grants and student scholarships across the U.S.
At many schools, students have to practice on parts that have been in use for many years and practiced upon by previous students. The parts donations by KSI Auto Parts help students work on parts for newer vehicles that they are more likely to see when they join the collision industry workforce. According to Joe Pantano, an auto collision repair instructor with Bergen County Technical Schools in Paramus, N.J., the donations helped him provide his students with a vastly improved learning experience. Collision repair facilities, insurance companies and suppliers interested in supporting school grants should contact Education Foundation Director of Development Brandon Eckenrode at (312) 231-0258 or Brandon.Eckenrode@ed-foundation.org. Founded in 1984, KSI is an industry-leading distributor of quality replacement auto body parts servicing over 20,000 collision repair shop customers across 25 locations in 14 states. In addition to top quality products, KSI has succeeded in providing superior customer service, rapid order turnaround and competitive pricing over the last three decades. Headquartered in South Plainfield, New Jersey, KSI has over 700 employees across the U.S. For more information regarding KSI, visit www.ksiautoparts.com. HOFFMAN ESTATES, IL (February 13, 2019) – Registration for the 18th Annual Collision Repair Education Foundation (CREF) Golf Fundraiser, co-hosted by the automotive refinish business unit of PPG, is now open. The event will be held Tuesday, July 23rd, 2019. Golfers will enjoy a round of golf at Brickyard Crossing Golf Course in Indianapolis, Ind., voted in Top 100 American Public Golf Courses by Golf Digest and Golfweek. This course has 4 holes inside the oval and 14 holes adjacent to the backstretch of the Indianapolis Motor Speedway. Organizers anticipate the Golf Fundraiser selling out during the spring, so early registration is encouraged. The event supports the Education Foundation in its mission to provide support for collision repair programs at high school and colleges across North America. Participants can register online through the Education Foundation’s website. Registration for the fundraiser includes 18 holes of golf, cart rental, beverages and snacks on the course, lunch, dinner, promotional items, and opportunities to participate in contests throughout the day. The event will be held in conjunction with the Collision Industry Conference and MSO Symposium events taking place that week in Indianapolis. HOFFMAN ESTATES, IL (February 6, 2019) – The Collision Repair Education Foundation 2019 grant and scholarship application period will close next Thursday, February 14, 2019. The application period is open for high school and post-secondary collision students who will be attending career and technical schools and colleges in the fall. The Foundation and its industry supporters offer over $200,000 in grants and scholarships annually, as part of their mission to promote collision repair education and create quality candidates for entry level job opportunities. Application information for CREF grants and scholarships is posted on their website, at https://www.collisioneducationfoundation.org/student-scholarship-and-grant-application-2/. This deadline to apply is February 14, 2019, and winners are chosen and notified by phone or mail in April and May. Collision repair facilities, insurance companies and suppliers interested in supporting scholarships or school grants should contact Education Foundation Director of Development Brandon Eckenrode at Brandon.Eckenrode@ed-foundation.org or (312) 231-0258. HOFFMAN ESTATES, IL (January 30, 2019) – The Enterprise Holdings Foundation continues its support of the Collision Repair Education Foundation with a contribution of $75,000 to support collision education. The donation benefits the entire industry by enhancing the Collision Repair Education Foundation’s ability to offer grants and scholarships to career and technical schools and colleges and the students attending these schools. The Enterprise Holdings Foundation is the philanthropic arm of the company that operates the Enterprise Rent-A-Car, National Car Rental and Alamo Rent A Car brands through its integrated global network of independent and regional subsidiaries and franchises. Industry members interested in joining the Collision Repair Education Foundation’s roster of supporters to assist high school and post-secondary collision school programs and students should contact Brandon Eckenrode, the Education Foundation’s Director of Development, at (312)231-0258 or Brandon.Eckenrode@ed-foundation.org. Enterprise Holdings – through its integrated global network of independent regional subsidiaries and franchises – operates the Enterprise Rent-A-Car, National Car Rental and Alamo Rent A Car brands at more than 10,000 fully staffed neighborhood and airport locations. Combined, Enterprise Holdings and its affiliate Enterprise Fleet Management accounted for $24.1 billion in revenue and owned 2 million vehicles throughout the world in fiscal year 2018. Enterprise Holdings’ regional subsidiaries and Enterprise Fleet Management currently employ 100,000 worldwide. Enterprise Holdings currently is ranked as one of America’s Largest Private Companies. Furthermore, if it were publicly traded, Enterprise Holdings would rank on Fortune’s list of the 500 largest American public companies. The Collision Repair Education Foundation is a national nonprofit and tax-exempt student organization under the Internal Revenue Service Code, Section (501)(c)(3).